Neighbourhoods - like the homes and the people that populate them - are infinitely interesting, especially when that neighbourhood is characterized by subtle changes through its history. This is most definitely the case in the neighbourhood of Parkdale - running downtown west along the arteries of King Street West and Queen Street West, just west of Dufferin - where a tapestry of housing stock has been made rich by numerous socio-economic influences over the years; these shaping influences have created the eclectically diverse range of homes that now populate the neighbourhood. It lends a unique visual texture to the leafy, tree-lined streetscapes of Parkdale, and is one of the cool by-products of a neighbourhood which has evolved for well over a century. Parkdale's roots hearken back to the mid-1800s. Its prime location, close to the Toronto waterfront, was a major draw for the upper class, making it one of the wealthiest neighbourhoods in the early days of Toronto. In fact, it was home to a number of spectacularly grandiose Victorian mansions. Its prominence continued well into the 20th Century, when neighbourhood hot spot, Sunnyside Amusement Park was 'The' waterfront destination! Simultaneously, Parkdale was also popular with the working and merchant classes, although their homes were significantly more modest. During the Great Depression, residential construction basically halted, and the hallmarks of the next chapter of this area were already underway. Sunnyside Park closed in the 1950s to make way for Gardiner Expressway and rerouting of Lakeshore arteries. This cut Parkdale off from the easy access to Lake Ontario, which ultimately propelled it out of fashion and towards decades of decline. Residential construction did eventually begin again, but this time the focus was largely on apartment buildings (in fact, dozen of homes - in fact some entire streets - or one side of a street - were 'blockbusted' and demolished to make way for these large apartment blocks). With the change in housing stock, there was in tandem a change in the demographic makeup of the neighborhood. Still, today, Parkdale is home to a high concentration of rental housing. What is fascinating about this neighbourhood is the diverse range of housing stock that has reflected the tastes and the socio-economic populous throughout its history and continues today. You are just as likely to see lavish historical manses as you are working class cottages, middle income dwellings or apartment mid-rises dating from the 1950s through 1970s. While these homes vary in size and in opulence, they do have much in common; they all have a role to play in telling the fascinating story of this neighbourhood. It is truly remarkable to be able to witness urban evolution when it operates in layers, incorporating the fibres of the past in its new iterations. To put this in context, consider these recent property sales that reflect the true diversity of the housing stock. Check out this tiny house behind a house on a pan-handle lot that makes clever use of its available space. It’s described in this feature in Blog TO as a “decked out garage”. This 1.5 storey home featured 2 bedrooms and 1 bathroom, and a contemporary kitchen. It offered condo-style living in a detached home setting, complete with outdoor living space - and the novelty of living in a quirky house as well. It recently sold for $587,500. All neighbourhoods have life cycles, including being influenced by demographics (I recently How Demographics Affect Toronto Real Estate, which I consider a valuable read). This semi-detached Edwardian house, built in 1906, was last purchased in 1965 for $10,000. It made headlines in January when the Seller, 108-year-old Ms. Lum, resided in the house until a few months ago when she sold it. Here's the story in The Globe And Mail Foon Hay Lum, 108, Sells The Home She Bought In 1965. Ready for transformation, the property garnered $875,000. One of Urbaneer's recent listings: A Modern Cube of Perfection this family residence was a study in contemporary cool. The former small wood frame aluminium clad cottage formerly on the site was structurally failing - like many working class cottages in the City built 100 years ago - rendering it 'land value'. My clients created this new 3-story, 3000 square foot contemporary dwell with voluminous proportions including a flex space plan which allowed for a two bed inlaw suite, or nanny quarters and a one bed apartment. Architecturally elevated, this four bed residence boasted ample natural light, a chic décor and numerous state-of- art mechanical and design components. The bold modern design and $1,950,000 sale price caused a bit of a fervor in the area. Ultimately, it was purchased by a family who had been residing for a decade in a three bed semi a few streets away, but were seeking a sun-drenched home for the next chapter of their lives. And then there is grand in a completely different context; this completely reconstructed infill project is sublime in how it creates an undeniably contemporary impression, yet subtly and with respect pays homage to its more storied Bay and Gable Victorian neighbours. Now standing on this lot are two, four-storey legal duplexes. Within each building are two completely separate two-storey penthouse-like suites, with three bedrooms and three bathrooms each. The interiors of these suites are strikingly stylish, with thoughtful layouts and high-end finishes and décor choices. What is most marvellous about these homes is the way in which they evolve the historical Bay and Gable style into the 21 st century, making prominent large windows, high pitched roofs, red brick and black mouldings. Even more interesting is how this design not only promotes its own aesthetic, but helps to pronounce the best features of neighbouring homes, giving its presence an additional design purpose. Located on a site that was originally a single family home on a double-lot - which, like Fern Avenue, was functionally obsolete - I applaud the intensification of the site and it's visually arresting design. This was celebrated on The Globe and Mail's 'The Architourist'. One of the pair sold last month for $2,500,000. On the other end of the design spectrum - and a reflection of the roots of Parkdale - is this stately Victorian mansion. This grand home's story began in 1879, when Scottish banker James Lockie bought a generous parcel of land on Lake Ontario. He built a sizeable brick home and two more homes further back on the property for his daughters. The area around the home was subdivided. It eventually became a home for psychiatric patients, released from local hospital. The Sellers purchased the home in the 1980s and had the home subsequently declared a heritage home. This sprawling manse absolutely sings with elegant detail, and retains many of its original elements, like huge (14-inch) baseboards, ornate plaster medallions and décor, elegant hardware and pocket doors. The Sellers embarked on a massive refurbishment of this home in the 1990s. Although much of the home has been reimagined to reflect modern day living, a three storey tower with ornate ironwork that was added in the 1880s to the home to increase its “curb appeal” to Beaty Ave still stands. Having four kitchens, the MLS copy said "There Is Plenty Of Room To Grow With 7685 Square Feet Of Space Above Grade. Soaring Ceilings Emphasize Spaciousness. Grand Rooms. Gracious Staircase. Many Original Architectural Elements Remain Intact. Beautifully Cared For. If You Cherish Heritage Properties, You Will Fall In Love With "Melrose". Bring Your Architect Or Designer To Plan The Next Chapter Of Melrose's Story." Now situated on a 99x 171 foot lot, this 'once waterfront' residence would have been steps to the beach. It sold in February for $3,340,000. Today, this vibrant neighbourhood is just as diverse as its history, which only adds extra dimensions to its unique character. There are high and low income residents, families, immigrants and young professionals all living as one community. This symbiotic relationship is reflected in the current housing stock as well. Looking for a home where you can write your own story in this evolving neighbourhood? 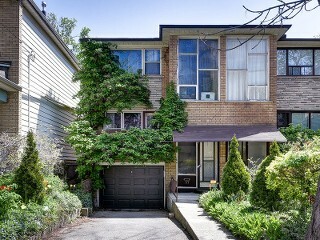 Check out my current listing in Parkdale in the photo above - an infill property in its own right dating from 1962 - which I call Mid-Century Magic On Sorauren, offered for $999,000. This 4 bed residence single family residene is offered for the first time in 55 years. It's an ideal family residence or well-suited to conversion into an income property to help create more much-needed rental housing stock in the downtown core. Check out my recent post called How To Strategically Purchase An Income Producing Property.